It is a simple 5 parts vodka vodka and 2 parts coffee liqueur cocktail served on the rocks in a old fashioned glass. 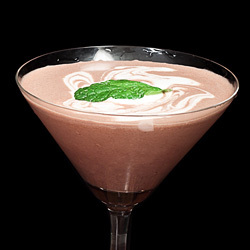 Its is widely known as Black Russian but since this cocktail recipe uses kahlua, it is sometimes referred as kahlua martini too. Take chilled old fashioned glass and fill it up with ice cubes. Add kahlua followed by vodka and stir gently. Garnish with lemon slice and cherry skewered on the cocktail stick and serve. 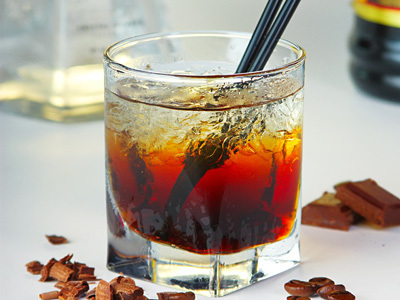 Use Premium brand of vodka so that vodka’s impurities does not mash or skew the flavor of coffee. For stronger coffee taste use 4 parts kahlua. For a difference, serve it in a Collins glass and top it up with coke (coca cola). You can also serve it straight up in a martini glass, however, make sure to stir all ingredients with ice in cocktail shaker before straining into glass. It must be served chilled.